Replay video: Watch video of Public Health and the Built Environment: Healthy Communities by Design presented on May 7, 2014 by the San Antonio Metropolitan Health District. The conference brought together public health professionals, architects, designers and other professionals interested in learning more about the correlation between the public health and the built environment. Thanks to our sponsors - San Antonio Metro Health, The Bexar County Community Health Collaborative, Methodist Hospital, CHRISTUS Santa Rose Health System and University Health System - anyone can replay the webcast of the conference plenary sessions right here on this page. Opening remarks by Dr. Thomas Schlenker of Metro Health; Dr. John Murphy of UTSA and San Antonio District 5 Councilwoman Shirley Gonzales; Keynote speech by Chuck Marohn, co-founder and president of Strong Towns. Planning for Health: Exploring the role planning plays in improviing public health. Moderator: John Dugan, Planning & Community Development Department; Speakers: Peter Bella, Alamo Area Council of Governments; Christin Vina, VIA Metropolitan Transit; John Osten, Development Services Department; Dr. Azza Kamal, UTSA College of Architecture. Scratchmade: Inspiring residents to see public space differently. Moderator: Monica Garza, YMCA; Speakers: Erika Ragsdale, City of Hutto; Justin Golbabai, City of Austin. Opening remarks: San Antonio District 1 Councilwoman Ivy Taylor; Introducttion by Laura Esparza, UT Health Science Center; Plenary address, John Simmerman, President, Active Towns. Moderator: Colleen Swain, Center City Development Office; Speakers: Andres Andujar, HemisFiar Park Area Redevelopment Corp.; Laura Esparza, UTHSCSA Institute for Health Promotion Research. "Intelligently built environments support and attract active, creative and healthy people," says Dr. Thomas Schlenker, director, Metro Health. Conference session explores what works both in San Antonio and around the country when designing and creating healthy communities. The conference featured national speaker Chuck Marohn, co-founder and president of Strong Towns. Marohn will address the need to rethink strategic infrastructure investments considering how communities have grown in the past. Additionally, national speaker John Simmerman, president of Active Towns, explored the critical factors that healthy communities possess in terms of active living and the built environment. Staff members from the Federal Reserve Bank of Dallas also presented on how to cultivate successful models of entrepreneurship and workforce development and their role in creating healthy communities. Conference sessions were designed to appeal to community members, elected officials, designers, planners, engineers, developers, health professionals, health advocates, school officials, bankers, students, community development lenders and anyone else interested in the topic. Thanks to our sponsors - San Antonio Metro Health, The Bexar County Community Health Collaborative, Methodist Hospital, CHRISTUS Santa Rose Health System and University Health System - anyone can watch the webcast of the conference plenary sessions right here on this page for free, live or later. The schedule below indicates which sessions will be webcast live, and which sessions will be recorded for replay later. Join the conversation on social media with #healthybuiltSA. THANK YOU to our sponsors: The Bexar County Community Health Collaborative, Christus Santa Rose Health System, University Health System, Methodist Hospital and San Antonio Metro Health. The conference is the result of a community effort lead by Metro Health in partnership with the UTSA College of Architecture, the American Institute of Architects – San Antonio Chapter, The University of Texas Health Science Center San Antonio Institute of Health Promotion Research and various city departments. “Among the many variables included in the design process, issues of healthy space and active design are paramount considerations for designing the built environment. As architects, it is our societal duty to advise the public through appropriate design solutions that support a healthier lifestyle,” says Dr. John Murphy, Dean, College of Architecture, UTSA. Sponsors of this year's conference include University Health System, The Institute for Public Health and Research, YMCA of Greater San Antonio, Natural Awakenings, Institute for Leadership in Capital Projects and the Texas Chapter of the American Planning Association Southwest Section. You can replay video from the 2013 Public Health and the Built Environment plenary session with Rick Bell, executive director of the American Institute of Architects (AIA) New York chapter, by clicking here. Disclosures: In addition to the listed webcast sponsors, NOWCastSA has received some financial support from the American Institute of Architects – San Antonio Chapter. 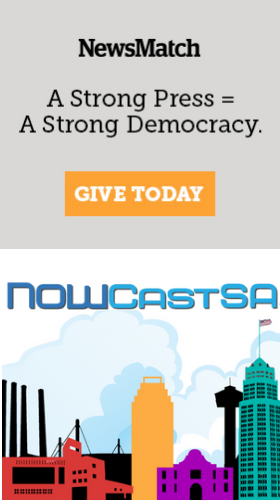 Pilar Oates is a current member of the NOWCastSA board of directors, and Thomas Schlenker is a past member.